The making of a California prison town. Of all the details Abdul Khan remembers of his flight from his home country, Ghana, perhaps the clearest is the glint of light on the machetes. He was 25 years old, and his textile business was failing. There were few jobs in his isolated village in Ghana’s mountainous interior, and Khan had started working for two gay men, who ran an underground male prostitution business. In Ghana, homosexuality is not tolerated. You can be imprisoned for it, and you can be killed. When Khan’s association became known, gossip began circulating that he, too, was gay. One day in the fall of 2014, his uncle sat him down for a talk. Renounce that friendship, his uncle said, or die. Khan had already heard rumors that his neighbors were looking to kill him before he “infected” their children, so he took his uncle’s threat seriously. One night, as he lay awake and fearful in bed, a group of men brandishing machetes approached the house. Khan jumped out of bed and escaped through a window in the back. Khan ran to his two gay friends, the only people he trusted. They told him that Ghana was no longer safe for him — that he should flee the country — and they scraped together money for him to buy a ticket to Ecuador, which did not require a tourist visa. On Nov. 6, 2014, Khan stepped off the plane in Quito, Ecuador’s capital. Before he’d even left the airport a man told him about a group of migrants, mostly from Somalia, Bangladesh and Pakistan, who were trying to reach the United States, and advised him to join them. America, the man said, was the only country where he would have rights. He introduced Khan to a smuggler who would arrange his journey to the U.S. border. Khan paid the man $800 of the $1,000 he had with him and three days later was on a bus heading north. He traveled almost 4,000 miles, passing through 10 countries via secret trails, in fishing boats and long canoes, through the uncharted jungle of the Darien Gap, through Panama, Central America and Mexico, to the border at Tijuana. When border officials asked him why he had come to America, Khan told them he had fled Ghana and come to seek asylum. For months, all he had thought about was survival, but soon, he imagined, he would be on his way to New York, where he had family. Instead, Khan was detained. He spent his first night in the United States on a concrete floor in a cold, windowless room at the San Ysidro Port of Entry. For five days, he was passed from one detention center to the next. Finally, Khan was brought to the Adelanto Detention Facility, where he would spend the next 16 months. Last December, almost two years later, I met Khan in New York, on a busy corner in the Bronx. Khan, whose name has been changed to protect his identity, wore dark jeans and Adidas sneakers, his boyish face framed by short curly hair and sideburns. Inside a Ghanaian restaurant, we shared a plate of fried plantains and beans, and he told me his story. It is a story that says much about the way the United States now treats asylum-seekers and immigrants, even before the Trump administration’s vitriolic rhetoric and attempted bans. It tells of the rise of corporate detention centers, and their role in reshaping communities in rural areas, including the West. The moment Khan fled Ghana, his fate became intertwined with one such place: Adelanto, California, a struggling town on the edge of the Mojave Desert that has hitched itself to America’s booming incarceration economy. A hopeful slogan for the Southern California town of Adelanto, which turned to a prison and detention-center economy after its military base closed. Adelanto sits 85 miles northeast of Los Angeles, on a flat and featureless expanse dotted with Joshua trees U.S. Route 395 runs through the middle of town, out of Southern California and toward a line of distant ochre mountains. Trucks barrel up and down the roadway that serves as Adelanto’s main thoroughfare, but there is no real center to the town. Instead, a haphazard collection of tract homes, trailer parks, warehouses, gas stations and fast-food restaurants spreads out over 56 square miles of desert. There are so many abandoned lots that the overwhelming impression is one of empty space. Adelanto, a town of 32,000, is home to three prisons. This was not a coincidence. A century ago, orchards covered parts of the Mojave Desert. Farmers grew apples, pears, plums, grapes and alfalfa. Crops were watered by the Mojave River, which begins in the nearby San Bernardino Mountains; its water supply, farmers believed, was inexhaustible. At the western edge of the valley, past the town of Victorville, Earl Homes Richardson, an inventor and industrialist, envisioned a “City With Unlimited Possibilities,” where soldiers returning from the Great War could recuperate in the high desert’s clean dry air. Richardson sold one of his patents in 1915 and bought a parcel of land for $75,000, hoping to subdivide it into one-acre plots and develop a master-planned community. But vets had no interest in living so far out in the desert, and Richardson’s vision never materialized. Instead, Adelanto grew up around the orchards, gaining some renown for its fruit and cider. As agriculture intensified throughout the Victor Valley, excessive water use and a series of dry years shrank the Mojave River. Adelanto’s farmers struggled, and when the Great Depression hit, many were forced out of business. The vacant land they left behind brought the U.S. military to the town’s northern edge in 1941. The Air Corps established an advanced flying school for World War II, and by 1950, George Air Force Base served as a training ground for fighter jets and bombers. With the base came jobs and steady tax revenue, and in 1970, Adelanto incorporated, becoming the smallest city in San Bernardino County. It was almost wholly reliant on a military economy, but planners hoped for more: giant shopping malls, new homes, and new people to boost the tax base. By then, a few poultry ranches were all that remained of Adelanto’s agricultural past. In 1993, however, the base closed, due to congressional realignments and closures at the end of the Cold War. People packed up and left, and property values cratered. Houses emptied and lawns died. Adelanto got its first prison in 1991: the Adelanto Community Correctional Facility, which held inmates for the California Department of Corrections. 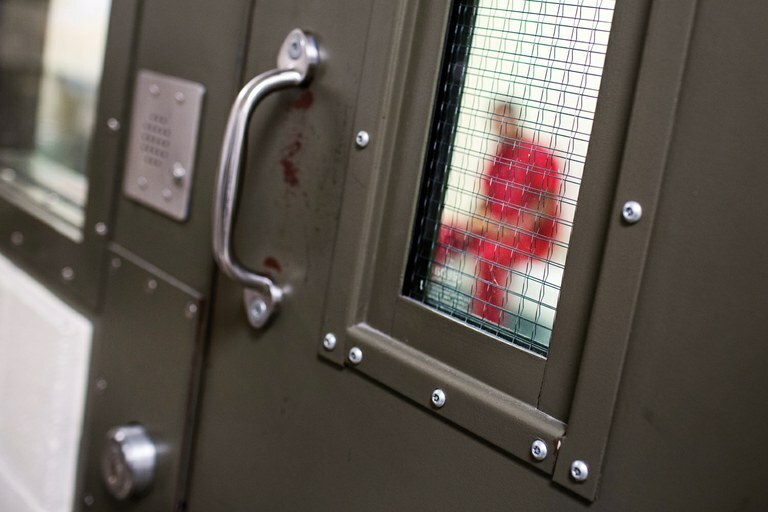 In just 11 years, the number of prisoners in California had more than quadrupled. That growth trend continued across rural America. In the 1960s and 1970s, about four new prisons were built in small towns and rural communities each year, according to the Agriculture Department’s economic research service. During the 1980s, that figure increased to an annual average of 16. The following decade, the number jumped to 25, with a prison opening somewhere in rural America every 15 days. By 2006, two more prisons were sited near or within Adelanto’s town limits: the High Desert Detention Center, a county facility, and a gigantic federal complex on the border with the neighboring town of Victorville. A few years later, the GEO Group, a Florida-based private prison company, offered to buy the old Adelanto Community Correctional Facility, for $28 million. Adelanto happily accepted. But the company had no plans to run an ordinary jail. Instead, GEO had its eye on the latest iteration of America’s prison boom, this one targeting immigrants. The county jail would be repurposed into the Adelanto Detention Center, housing asylum-seekers and others caught in immigration bureaucracy. Adelanto’s detainees are among the 40,000 people held every day in over 400 facilities nationwide by Immigration and Customs Enforcement, or ICE, pending a decision in their immigration cases or while awaiting deportation. A fortified compound surrounded by high barbed-wire fencing, the Adelanto Detention Center sits at the end of a paved road near an industrial zone on the outskirts of Adelanto. When Khan was brought there on Dec. 11, 2014, it was the middle of the night, but he could still sense the confinement. He felt confused, he told me. This was not the America he had envisioned. Why, he wondered, was he being treated like a criminal? The guards gave him a blue jumpsuit and escorted him to a windowless dormitory. Soon, he learned about the “segregation units” used to isolate unruly detainees. By law, immigrant detention facilities are not supposed to be punitive, but the official distinction between “detainees” and “prisoners” seemed largely meaningless. Guards conducted daily headcounts — usually five or six, each one up to an hour, during which time detainees had to remain in place by their beds. Khan had a particularly hard time with the handcuffs, which guards placed around his ankles and wrists any time he was transported outside the facility for a court appointment. He had broken no laws and had not crossed the border illegally. He had simply asked for protection. He, like many of the other asylum-seekers held in the detention center, had passed a “credible fear” interview and had no criminal record. Back in Ghana, Khan had always imagined America as a country of freedom; a country where basic human rights were protected. Why keep us locked up? he thought. If you don’t want us, tell us to go back. An inmate is seen behind the locked door at the Adelanto Detention Facility. 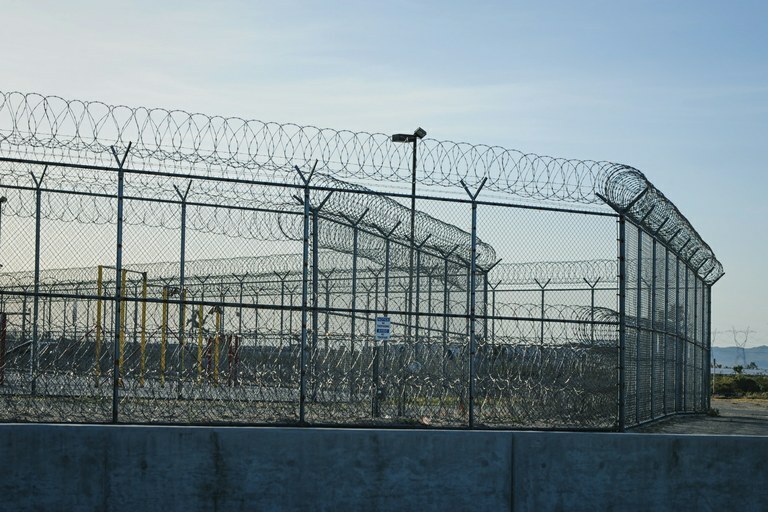 Formerly a California state prison, it is now owned by the private prison contractor GEO Group and houses nearly 2,000 detainees of U.S. Immigration and Customs Enforcement. A guard escorts an immigrant detainee through the Adelanto Detention Facility in Adelanto, California, where around 2,000 detainees of Immigration and Customs Enforcement await hearings on their immigration status. Cari Thomas is the former mayor of Adelanto. She has long red hair and a no-nonsense air. An Adelanto transplant who was born in the L.A. suburbs, she saw the high desert as an affordable place to live — where land was cheap and a comfortable, middle-class life still in reach. Elected to city council in 2008, Thomas became mayor in 2010 and oversaw the GEO Group’s arrival. Adelanto had plenty of incentives to keep the detention center full, she told me last fall, over an egg breakfast at Denny’s. After the base closed, the town struggled to replace the lost jobs and revenue. Houses that once sold for $80,000-$100,000 plummeted to half their value. “It was horrible,” Thomas said. Throughout the mid- and late 1990s and early 2000s, money flowed into the town, as new housing developments were built — part of the nationwide housing boom. For a while, “things were good,” Thomas said. But it didn’t last. The 2008 recession hit, and Adelanto suffered another housing crash and another wave of sunken hopes. Thomas had dreamed of turning Adelanto, with all its space, into a town like Rancho Cucamonga, an hour south, with its colossal malls and shining housing developments set against the San Gabriel Mountains. But the Adelanto she inherited was in dire financial straits. “It was a really bad time to get into politics,” Thomas said. She spent much of the next four years just trying to balance the budget. In the wake of 9/11, private prison companies like GEO saw a lucrative business opportunity in the government’s immigration policies. Throughout rural Texas and the Southwest, new for-profit immigrant detention facilities sprang up, bolstered by more and more government contracts. Last year, for instance, GEO’s revenue was over $2 billion, 18 percent of which came from ICE — the highest of any government contractor. To protect its profits, the industry developed a number of tactics, such as incorporating so-called “guaranteed minimums” into detention center contracts, ensuring the company gets paid for a certain number of beds, whether or not they’re filled. For GEO, the deal offered plenty of perks, too. The facility was already built — the company just needed bodies to fill it. 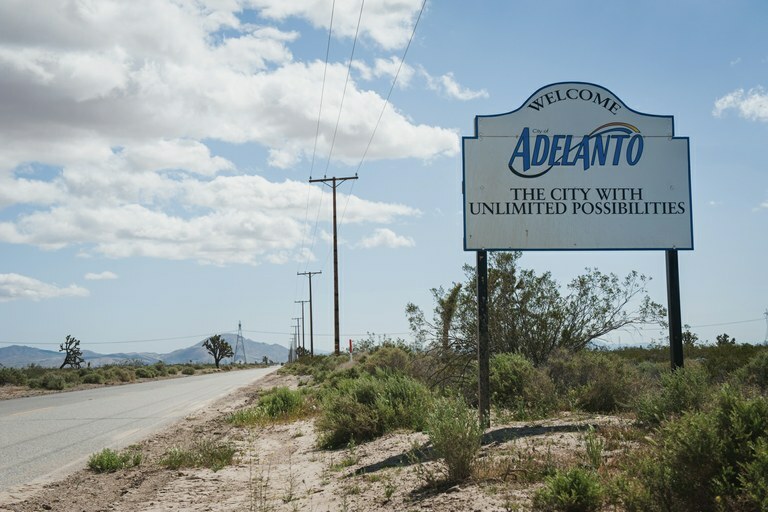 As part of the sale agreement, the town was obliged to secure the government contracts that would bring immigrant detainees to the newly renamed Adelanto Detention Facility. ICE would then pay GEO money based on the number of prisoners held in the facility, with the town serving as the middleman. GEO quickly expanded the facility to hold 1,300 detainees. Its contract with ICE included a 975-bed minimum occupancy rate guaranteeing GEO roughly $40 million per year. According to documents obtained from a state records request filed by Community Initiatives for Visiting Immigrants in Confinement (CIVIC), Adelanto was only paid a flat yearly $50,000 “administrative fee” from GEO for its initial 650 bed capacity, even though the company had expanded the facility to hold 1,300. City Councilman John Woodard, center, tours a medical marijuana production facility — a new revenue stream the town is pursuing — being developed in Adelanto’s industrial area. Former Adelanto Mayor Cari Thomas cut the first deal to transform a former state prison into a privately run detention facility for ICE. Current Mayor Rich Kerr, elected on an anti-prison platform, now embraces them. Khan thought he had all the papers required to prove his identity. He had financial documents showing he had family who could support him and an uncle in New York to stay with. He assumed he would be released. Yet the ICE officers denied him parole, claiming that Khan’s documents were insufficient. This kind of detention is not uncommon. According to a recent report by Human Rights First, ICE has increasingly refused parole for asylum seekers — even when they meet the official criteria. In 2012, 80 percent of asylum seekers who passed their credible fear interview were granted parole. By 2015, the number had dropped to 47 percent. The sharp drop coincided with an influx of migrants from Guatemala, El Salvador and Honduras, many of them asylum-seekers. On June 20, 2014, Secretary of Homeland Security Jeh Johnson announced a plan to significantly expand detention capacity to detain and quickly deport Central Americans, in an attempt to “send a message” to those seeking asylum or attempting to cross the border illegally. Caught up in that policy, Khan would have to prove his case from inside Adelanto. The prospect of indefinite detention terrified him, a fear made worse by the smaller indignities he endured. Sometimes, the meat served at mealtimes was moldy or rotten, compelling many detainees to buy much of their own food at the GEO-run commissary, but Khan had no money to spare. Often he barely ate. GEO guards barred him from praying with other Muslim inmates, denying him an important part of his religious practice, while Christian detainees were allowed to attend church three times per week. (GEO later changed its policy in response to complaints.) Khan felt powerless in the face of the discriminatory rules, but the threat of the segregation units, or SU, which mirror the solitary confinement cells used in prisons housing criminals, kept him in check. “You want to fight for your rights, but if you fight too hard, you will be put in the SU,” he said. Sometimes, entire units experienced multi-day lockdowns as group punishment for one detainee’s actions. “If anything happens, they put us in our cells and locked the door,” Khan said. He learned not to attract attention, to keep his anger and despair in check, to pray alone. Due to the backlog in immigration courts, which is now more than 500,000 cases long, asylum-seekers can remain in detention for months and sometimes years while their cases are processed. Khan felt like he existed outside the law. That is not entirely wrong: Unlike criminal defendants, for example, Khan had no right to a lawyer. Like most immigration detainees and asylum-seekers, he could not afford one and would have to represent himself. For the next six months, Khan waited to find out when he would have his asylum hearing. He tried to bolster his case, researching the repression of homosexuality in Ghana and instances where people were imprisoned or killed for aligning themselves with gay and lesbian rights, but detainees could only use the law library for an hour a day and had no access to the internet, and so Khan struggled to find information. He wanted to call friends and family to see if they could help, but he couldn’t afford the high rates charged by TALTON Communications, the detention center’s for-profit phone service provider. Even if Khan had been able to pay for a lawyer, he would have had a hard time finding one. Immigration attorneys like Fagen rarely take cases involving Adelanto detainees because of the long commute; a round-trip drive from LA can take most of the day. And there’s a low chance of success. Adelanto’s six immigration judges are among the harshest in the country. The most lenient of them denies 75 percent of asylum cases, according to data compiled by researchers at Syracuse University. Among the two harshest, the denial rate is over 91 percent. Early in his career, most of the immigrant detainees Fagen dealt with were in two facilities closer to downtown LA: the San Pedro Processing Center on Terminal Island and the Mira Loma Detention Center in Lancaster, run by the Los Angeles County Sheriff’s Department. The shorter drives meant he could take on more clients who were detained, he said. Terminal shut down in 2014 after an internal review found the facility too unsafe, and ICE ended its contract for Mira Loma in 2012, transferring detainees to Adelanto, in part because the GEO contract was cheaper — even though it raised the costs for detainees. Demonstrators with the Caravan Against Fear, a roving protest against U.S. immigration policies, gathered outside the Adelanto Detention Facility West in April. The proceeds from Adelanto’s GEO deal temporarily plugged the town deficit but failed to generate the substantial long-term revenue that the town needed. By 2014, Adelanto was once again contemplating bankruptcy. Around that time, a pair of private developers sought out Adelanto for another private prison. 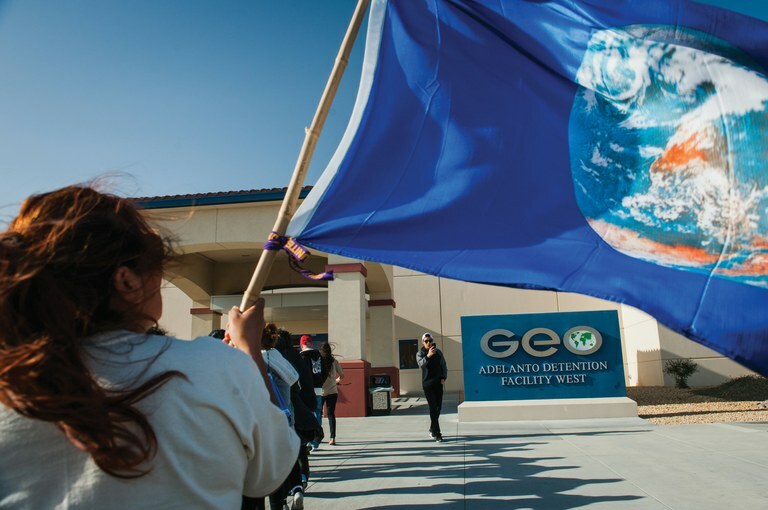 The GEO Group, meanwhile, came forward with plans to expand the Adelanto Detention Facility to 1,940 beds, making it the largest immigrant detention facility in California. Thomas supported the expansion. The town was $2.6 million in the red and needed the additional money that the additional detainees would bring in. As the November 2014 election approached, Richard Kerr, an upstart candidate, ran on a platform that included no new jails. Kerr narrowly defeated Thomas and is still mayor today. Last fall, I met him at his office in the Adelanto City Hall, a stucco, faux Spanish-colonial style building overlooking the swath of empty desert where the GEO prisons sit. A former Marine, Kerr has a mustache and often wears jeans to work. He has, in his words, a “maverick” approach to city politics. Almost immediately following his election, the new mayor changed his mind about prisons. Once he found out he could re-negotiate the per-bed rate that GEO paid Adelanto for each detainee held in its facilities, Kerr decided that the prisons were not as bad as they were often made out to be. “We need the money in the city,” he told me. According to the mayor, GEO had no problem paying a higher rate and Kerr appreciated the company’s donation to the rodeo and the local Christmas fund. GEO also paid the town $175,000 to fund an additional police officer. “They’re 100 percent behind us,” he said. The city council approved both the new prison and the GEO expansion. On July 1, 2015, the Adelanto Detention Facility got 640 more beds, specifically designed to house women detainees. The new beds would bring in an extra $21 million for GEO. Along with another GEO-run state prison, there were over 9,000 people behind bars within a seven-mile radius of Adelanto — almost a third of the town’s total population. Renegotiating the GEO contract, Kerr told me, means Adelanto now receives $80,000 per month from GEO in bed tax for its two facilities — an eighth of the town’s total budget. Still, like most local officials I spoke with, Kerr would rather not dwell on Adelanto’s prisons or the role they play in the town’s economy. Instead, much of our hour-long conversation revolved around marijuana, which Kerr believes is on the cusp of transforming Adelanto from down-and-out prison town into a haven for California’s nascent medical marijuana industry. Chain-link and razor wire surround the Adelanto Detention Facility East, one of two private facilities operated by the GEO Group in Adelanto, California, with beds contracted to Immigration and Customs Enforcement. The company is approved to build a third facility nearby. After six months in detention, Khan still had no verdict on his case. He was eligible for a bond hearing, which offered him a chance at release, but the judge set the bond at $28,000 — far beyond what Khan could afford. And so, like many detainees with limited means, he remained in Adelanto. A couple weeks later, in May 2015, the same judge, denied his asylum case, citing lack of evidence. Unless Khan appealed the decision, he would be deported. Khan didn’t see much point in appealing. He would have to continue his fight from inside Adelanto, a process that could take years and most likely would not yield any new evidence. For Khan, remaining in Adelanto seemed even worse than what he might face back in Ghana. It was better, he told the judge, for him to go back and face the consequences. “I’m ready for anything,” he said. Khan signed his deportation order and prepared for the worst. But before he could be released, immigration officials had to obtain a travel document from Ghana — essentially a guarantee that it would accept its citizen back once the U.S. had deported the person. In the meantime, Khan waited in Adelanto. Three months passed. An ICE officer told him they were still waiting to receive the documents from Ghana, which is among around two-dozen countries that often delay repatriating people from the U.S. Almost a year into Khan’s detention, in October 2015, he and a group of other detainees wrote a letter to ICE, requesting to speak with Gabriel Valdez, the assistant field office director for Adelanto. They wanted to know why they were still locked up, even after many had signed their deportation orders. When their request went unacknowledged, Khan and more than 90 detainees — mostly asylum seekers — began refusing to eat. Theirs became the fourth hunger strike at U.S. immigration detention facilities in less than three weeks. 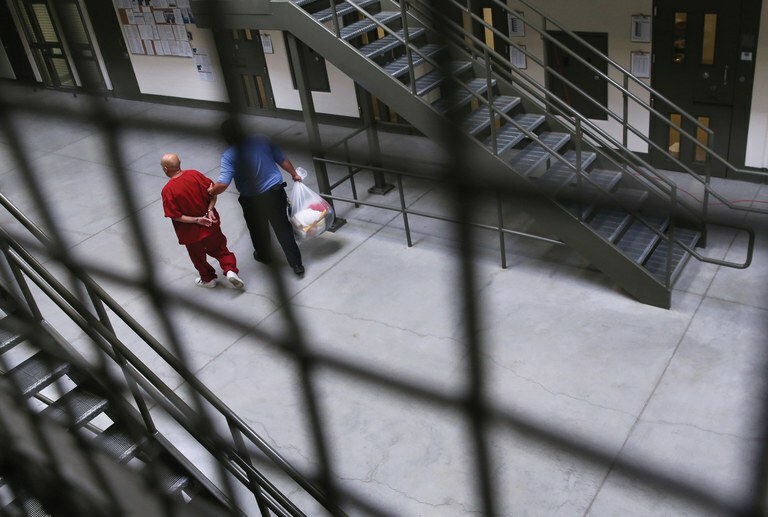 At least some immigration judges have questioned the escalating use of detention. Last October, a group of former immigration judges wrote to Johnson, the former secretary of Homeland Security, expressing concern that the expansion “comes at the expense of basic rights and due process.” People eligible for protection under U.S. and international laws are kept in jail-like facilities operated by private prison companies or local jails contracted by ICE. “A shocking 86 percent of immigrants in detention are unable to obtain legal representation,” the judges noted. The system creates a deep sense of despair for the people trapped within it. During Khan’s detention, eight people attempted suicide, and 115 were placed on suicide watch. In 2015, CIVIC and the Detention Watch Network chronicled numerous reports of sexual assault and abuse. The poor medical care led to two deaths. In late March of this year, a Nicaraguan man facing deportation hanged himself. Osmar Epifanio Gonzalez-Gadba, who did not have a criminal record, had been detained in Adelanto for three months. Three weeks later, Sergio Alonso Lopez, a 55-year-old Mexican detainee, began vomiting blood and later died in hospital. He had a history of serious medical issues and had been deported to Mexico three times previously. 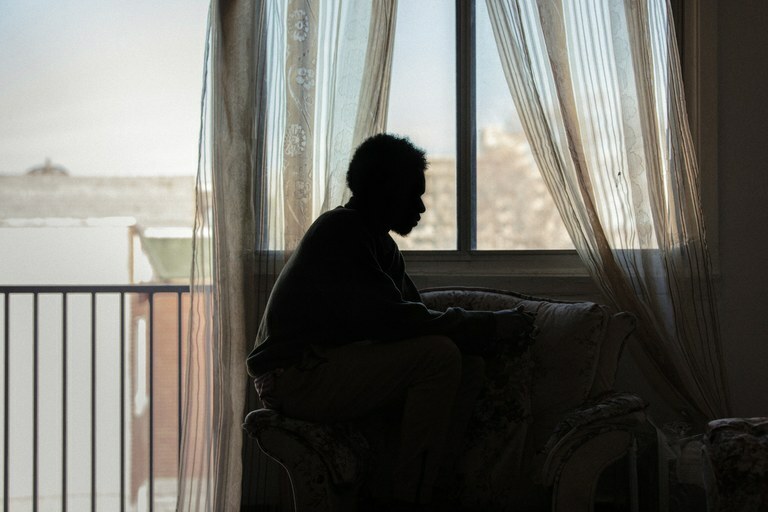 Abdul Khan, who fled New York out of fear of deportation after Donald Trump was sworn in, currently resides in Montreal. His name has been changed in this story to protect his identity. One day last spring, one year, three months and three weeks into his detention, a guard told Khan he was being released under supervision. ICE had decided to let him out while the agency continued its efforts to get his travel documents. At first, Khan thought the guards were lying — but when the guards gave him back his old clothes and told him to change out of his prison uniform, he began to believe. On March 23, 2016, Khan was set free. One of Khan’s relatives, who lived in Canada, wired Pamplone $300 — enough for a bus ticket to New York, where an uncle lived. Two days after his release, Khan said goodbye to Pamplone at the Greyhound station in LA, and set off east, to endure whatever fate had in store. Note: This story has been updated to fix a misidentified roadway. It is U.S. Route 395, not Interstate. This coverage is supported by contributors to the High Country News Enterprise Journalism Fund.